I don’t know what possessed me to put my work address on this swap, but I did. It turned out well, because in the middle of a busy work day, I had a fun package to open on my break. It was from my Hot Socks Pal, Shannon, in the next town of Quantico! 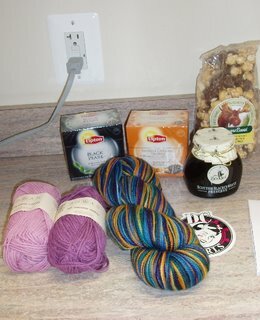 She sent some lovely treats and yarns! Just look! She acts like she knows me! This has been a fun swap. I sent my box today to my pal in Germany. I hope she likes the Fleece Artist sock yarn and Celestial Seasonings Teas I sent. Now, I will get back to shopping for my SP9….. When I saw that you were from the next town over I thought it was hilarious. It was great looking for items for you . I also have to shop for my SP9, Goodluck!